Why do chargebacks happen and how can merchants avoid them? Fraudulent and non-authorized transactions represent approximately 52 percent of all disputes, according to Reason Code Encyclopedia, published in 2016 by Chargeback.com Inc. When shoppers buy products online, they enter credit card data on a payment form, which is a different than presenting a physical card to a cashier. These card-not-present transactions are thus more susceptible to fraud, which elevates the level of risk for ecommerce merchants. It’s critical for ecommerce merchants to detect anomalies and block fraudulent transactions before they occur. Many customer inquiries and disputes can be resolved before they become chargebacks. Additionally, merchants who react quickly to retrieval requests by providing additional transaction information can resolve a high percentage of chargebacks. Customers who sign up for subscription services may balk at reoccurring charges on their monthly billing statements. This may prompt them to dispute the charge or request to cancel the service by charging back the transaction. The Chargeback.com study found this type of dispute accounts for 19 percent of all chargebacks. Subscription service providers must make it easy for consumers to opt out of recurring billing, and issue credits when shoppers choose to terminate or not renew a service. Most recurring billing chargebacks can be avoided by aligning front and backend processing systems to ensure that no invoices, charges occur or merchandise is shipped after a cancellation date. Customer complaints about products and services are the third most popular type of dispute, representing 18 percent of all chargebacks, according to Chargeback.com. These transactions can take many forms. Customers may claim a service representative was discourteous, or a product was defective or not as described. These complaints can create negative publicity and may also lead to further investigations by card issuing banks and regulatory agencies. Most payment card brands require customers to contact merchants with any concerns or issues and to return merchandise before attempting a chargeback. If the returned merchandise is shown not to be defective, merchants can notify their banks. Merchants that credit customers for returned merchandise can usually avoid additional chargeback fees. Merchants who have not upgraded their POS systems in accordance with the EMV (Europay, Mastercard and Visa) Liability Shift, which became effective for most merchants Oct. 1, 2016, are now liable for fraudulent and counterfeit credit card transactions that occur on their noncompliant processing systems. The chargeback.com study found this form of chargeback only represents 3 percent of all chargeback disputes. While there has been a spike in chargebacks since the October 2015 liability shift was instated, many non-compliant merchants have found that they are being charged back for transactions that are not even EMV-related. For this reason, payments analysts are recommending that merchants work with their processors or third-party service providers to address chargebacks automatically triggered at noncompliant POS stations, to identify root causes within appropriate timeframes. The broad, miscellaneous category classified as “other” in Chargeback.com’s study, includes mistakes made by both merchants and consumers, such as incorrectly entering a credit card number, or unintentionally duplicating a credit card transaction by double entry at the POS, or “friendly fraud,” which involves cardholder claims of not having authorized or received a product or service. While EMV has eliminated many forms of card-present, friendly fraud, it has pushed fraudsters to card-not-present (CNP) fraud. Trained employees who can recognize fraudulent cards in the checkout lanes and advanced fraud monitoring systems that detect online fraud can help prevent and reduce online and in-store friendly fraud. Betterpay provides merchants with dedicated support and resources to prevent chargebacks and respond immediately when they do occur. 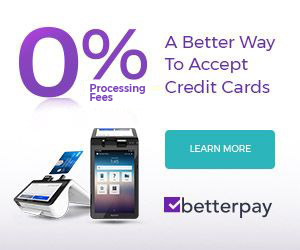 For a simple, fast and better way to prevent chargebacks, process credit cards or fund your business, contact Betterpay. Copyright © 2019 Betterpay. All Rights Reserved. Betterpay is a registered ISO/FSP of Woodforest National Bank in Houston, TX - Member FDIC and a registered ISO of Wells Fargo Bank, NA. Canadian Branch.